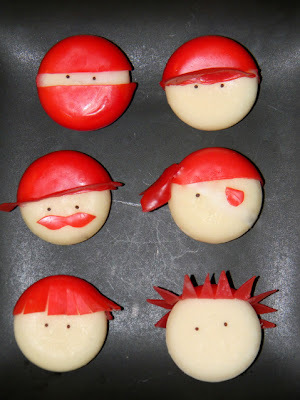 I haven't met a kid yet that doesn't like Babybel, if only for opening them but these take on a whole new meaning. I am dying for the next grandchild's birthday party so I can try some. make raindrops out of the cheese. These are very lovely, but I have to ask why it is only a boy's party that has interesting cheese shapes. If it is because they do not come in pink, then I would like to question your stereotype.